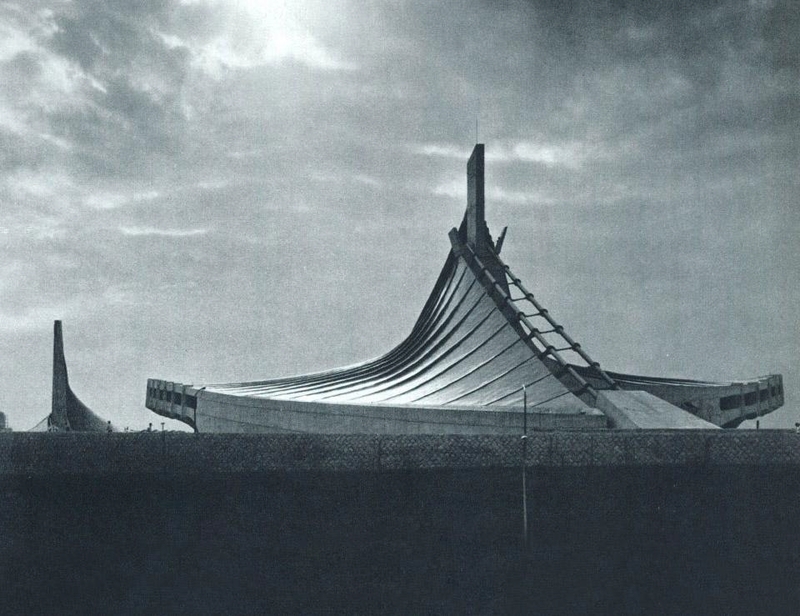 As in the past, with the Yoyogi National Gymnasium Kenzo Tange continues to stimulate the creative possibilities of the architecture of our times. Designed and built between 1961 and 1964 to house swimming and diving events in the 1964 Summer Olympics, the design inspired Frei Otto’s arena designs for the Olympic Stadium in Munich. Engineers Yoshikatsu Tsuboi and Uichi Inoue. The biggest problem, with respect to the interior space, was guaranteeing that it not take on inhuman proportions when empty or filled with just a few people.We wanted to create and maintain a unified environment where athletes and spectators share growing mutual emotion. A single space—not closed and oppressive but free and open—a space in which the fifteen thousand spectators can also move and flow ‘gently’ in functional and psychological terms. Built for the 1964 Summer Olympic Games in Tokyo, Japan, the Yoyogi National Gymnasium has become an architectural icon for its distinctive design. 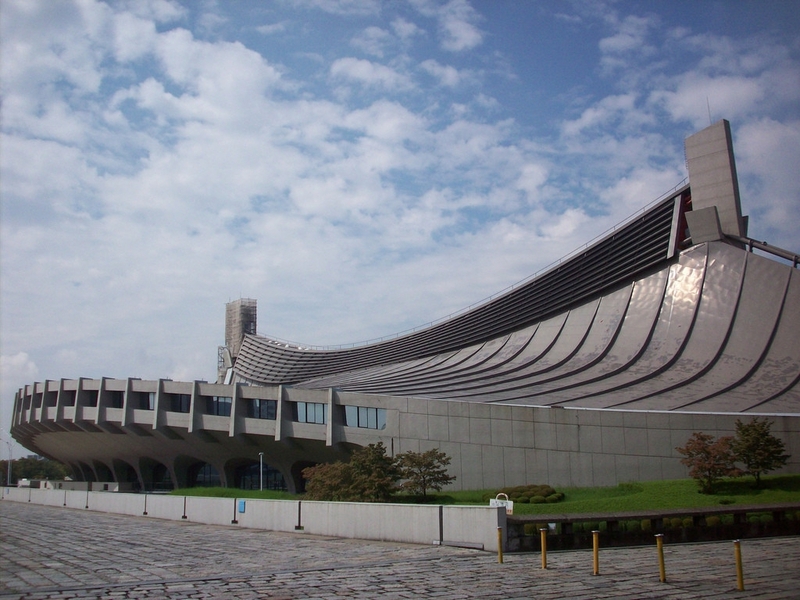 Designed by one of Japan’s most famous modernist architects, Kenzo Tange, the gymnasium is a hybridization of western modernist aesthetics and traditional Japanese architecture. Tange’s innovative structural design creates dramatic sweeping curves that appear to effortlessly drape from two large, central supporting cables. It’s dynamically suspended roof and rough materials form one of the most iconic building profiles in the world. Sitting within one of the largest parks in the metropolitan region of Tokyo, Tange uses the context as a way in which to integrate his building into the landscape. The subtle curves of the structural cables, the sweeping roof plane, and the curving concrete base seem to emerge from the site appearing as one integrated entity. 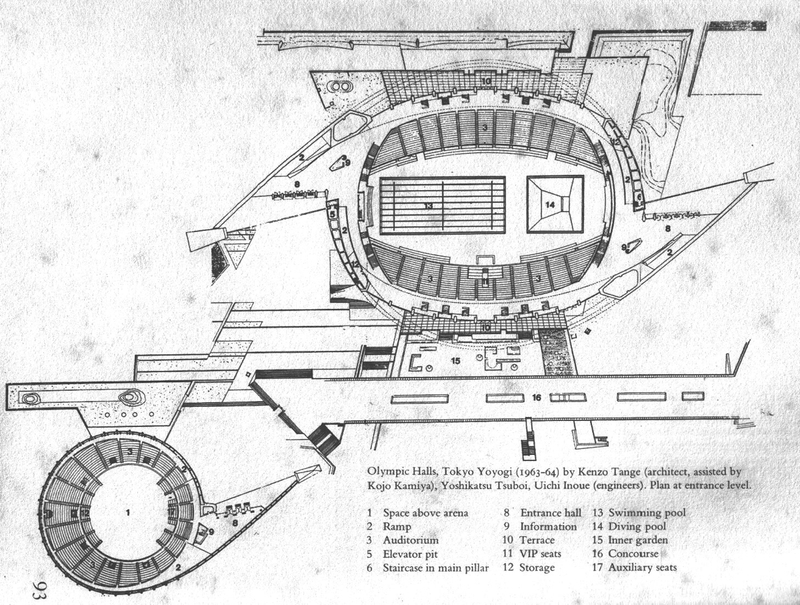 The gymnasium is the larger of two arenas for the 1964 Summer Olympic Games both of which are designed by Tange and employ similar structural principles and aesthetics. The smaller pavilion which holds approximately 5,300 people is used for various small Olympic events, whereas the national gymnasium was designed to be occupied by 10,500 people primarily for the Olympic swimming and diving competitions. However, it was able to be transformed into a space to accommodate for larger events such as basketball and ice hockey. 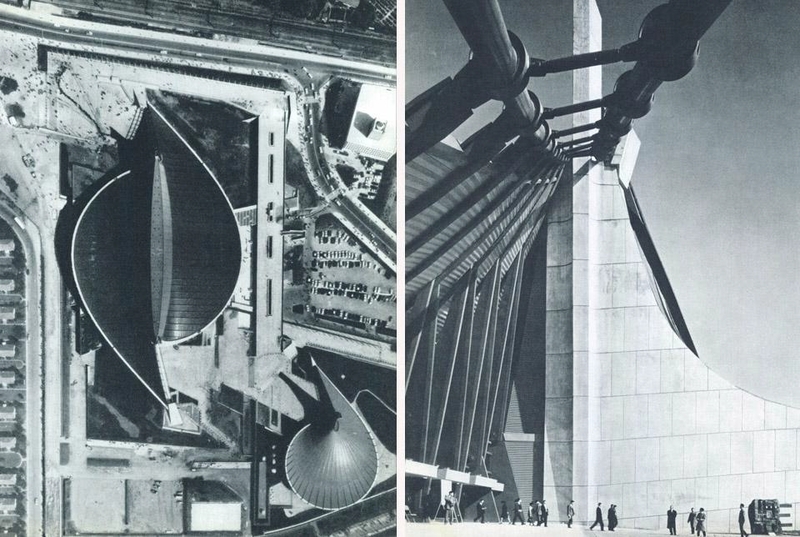 Influenced by Le Corbusier’s Philip’s Pavilion and Eero Saarinen’s hockey stadium at Yale University, Tange became intrigued with structure and its tensile and geometric potential. 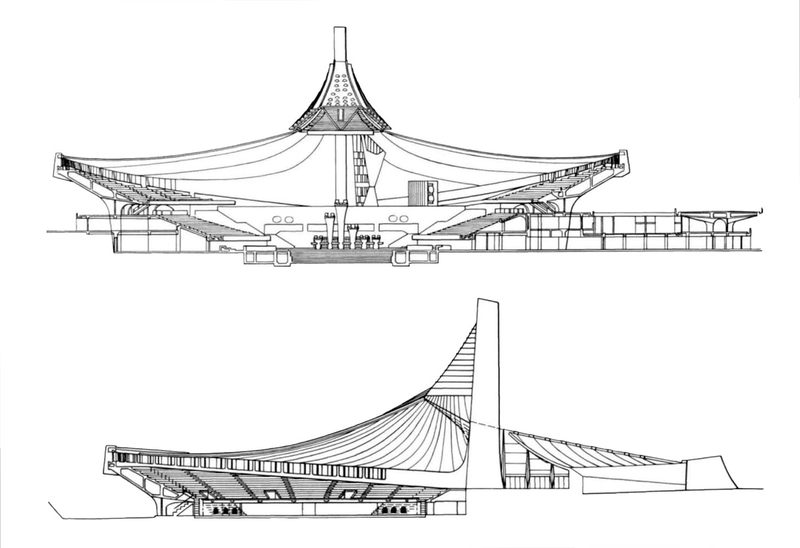 Similar to Saarinen’s design for Yale’s hockey stadium, Tange employs a central structural spine from where the structure and roof originates. Two large steel cables are supported between two structural towers in addition to being anchored into concrete supports on the ground. The suspended cables form a tensile tent-like roofing structure; a series of pre-stressed cables are suspended off of the two main cables that drape toward the concrete structure that creates the base of the gymnasium as well as providing the necessary structure for the seating within the stadium. From Tokyo-based French architect and film maker Vincent Hecht comes “Classic Japan,” a series of short films focussed on Japanese architecture from between the 1950s and 80s. 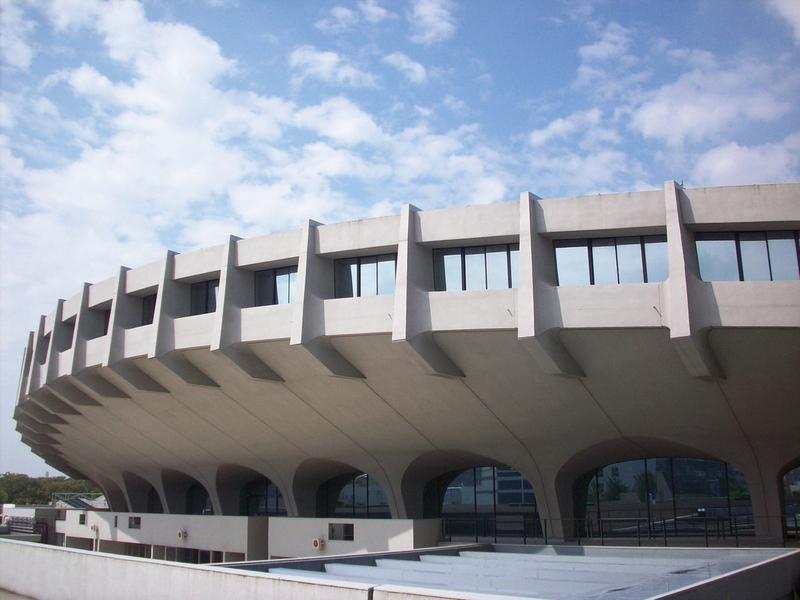 Cite this article: "National Gymnasium for Tokyo Olympics / Kenzo Tange," in ArchEyes, February 1, 2016, http://archeyes.com/national-gymnasium-for-tokyo-olympics-kenzo-tange/.